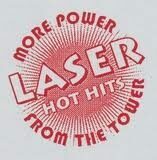 Welcome to Laser Soul Hits. This website was created in the summer of 2015 by Laser Hot Hits DJ and presenter Gary Drew as a tribute to the 1980's land-based soul pirates from the London area and similar music from that decade. The first broadcasts were made on 87.8 and 95 MHz FM to localised areas in the home counties. By late spring 2017 LSH was to become more than just a small FM station and tribute site as internet streaming was added turning LSH into an online radio station playing soul, funk and rare groove with the occasional splash of reggae, dance and hip-hop. LSH shares the memories from the London soul pirates by rebroadcasting original and restored pirate archives from the 80's period and related programmes of interest along the same lines. We also bring you shows from our sister station Laser Hot Hits International and broadcast sponsored shows and content from offshore pirate radio and documentaries for the real radio enthusiast. We now broadcast worldwide on the internet 24 hours a day and low power transmissions continue on the same original frequencies listed above with higher power transmissions at various times on 87.7 & 98 FM from our relay partners. Shortwave tests took place via a third party on 17th February 2018 on 6240 KHz to Europe and more tests are planned for 2019 with the hope of sharing airtime with other shortwave outlets at weekends. Laser Soul Hits is a sister station to Laser Hot Hits which itself began as an FM pirate radio station broadcasting to the home counties of England in April 1990 and later broadcasts came from London. By 1993 Laser merged with staff from pirate station Hits FM to form Laser Hot Hits International which then moved from FM to shortwave and is still broadcasting today both on shortwave and the internet. The concept for the station came from the former offshore pirate radio station Laser 558 which broadcast in 1984/85 and was later followed by the offshore station Laser Hot Hits from 1986/87. 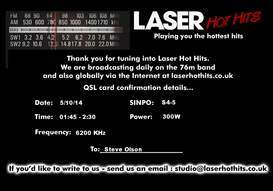 LHH currently broadcasts on 6205 KHz in the 48 meter band shortwave on weekday evenings and all weekend and between 1476 - 1512 KHz medium wave and on 98 FM on the south coast of England. New show "Nigel James - Laser Hot Hits International - The Shortwave Legend Thu..." up now at https://t.co/xBVvpFQPoC Check it out now!